If you use my daily editing math word problems you know that I like to incorporate interesting "holidays" into my lesson plans. 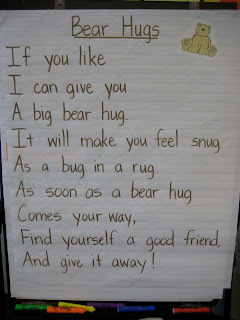 This Friday was Teddy Bear Day. We made a day of it by inviting our bears (or other furry friends) to spend the day with us. We got in the spirit by making teddy bear headbands. We made a class book introducing our furry friends. You can download a copy here. There was a little drama when one boy's white teddy lost his eye. Luckily we found it! I gave them the writing prompt: "Today my teddy bear came to life and..."
Today my tiger came (to) life and it was playing on the monkey bars. 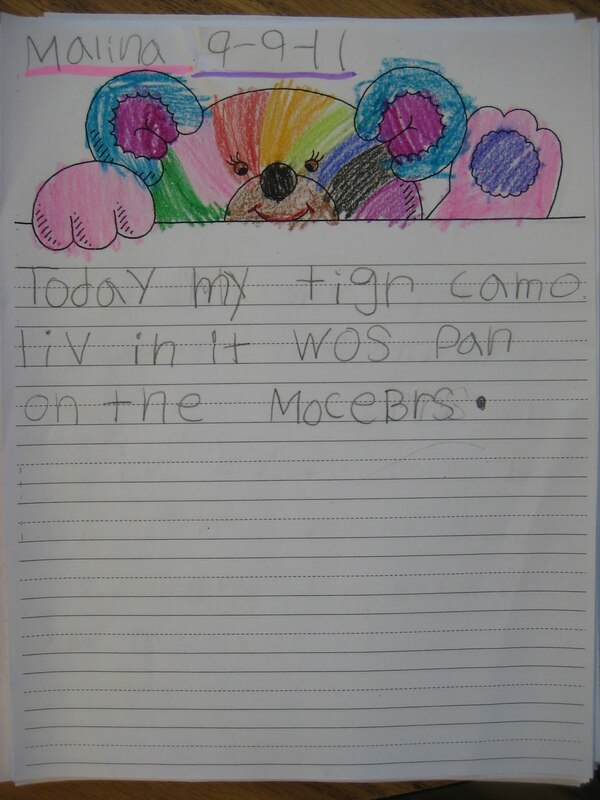 They had a lot of fun coming up with what their bear would do. Today my teddy bear came to life and my teddy bear ate my lunch. Each child got a bag with 12 gummy bears. They sorted by color, made a bar graph, and then answered questions like which color did you have the least of? The graph I got from Teaching Heart. Of course, we also read some bear stories. 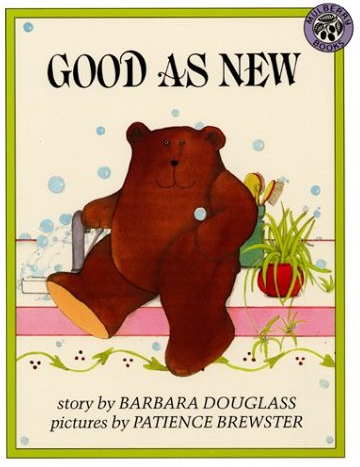 We didn't have time because we have music class on Fridays but I was also going to have them measure their bears with unifix cubes and then do some comparing. It was a fun-filled day that I hope the children will remember fondly when they think back to first grade. In other news, I would like to thank Teacher Education Degrees for naming my blog to their Top 50 Early Childhood Education Blogs. There are so many wonderful teaching blogs out there I was greatly surprised and honored. Thanks for sharing!! Very cute!! 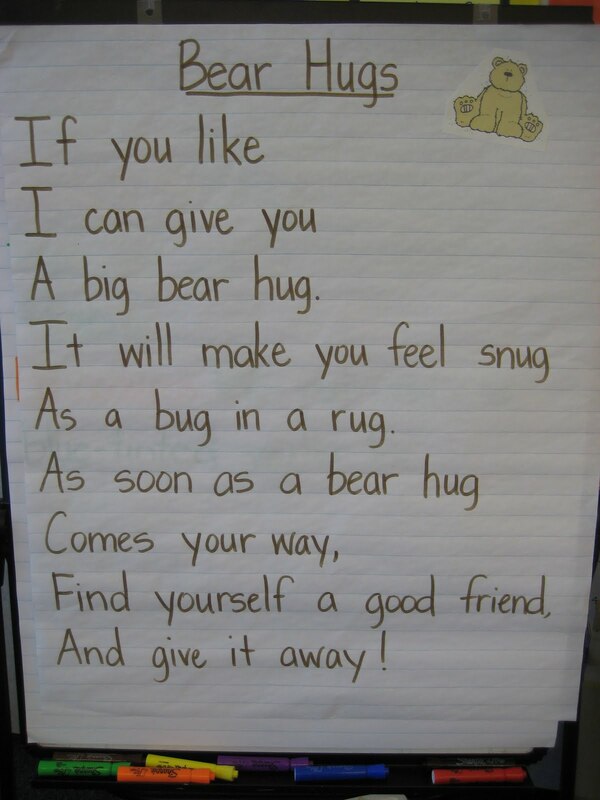 Love your teddy bear day - I do a teddy bear unit in November and will borrow some of your ideas, thanks! Another fun day, one of my fave's, is 'international talk like a pirate day', next Monday Sept 19th. We always have fun with that one! Oh, Happy Day! I just wanted to let you know that I have chosen you for the Versatile Blogger Award. Stop by my blog to check it out! I have been visiting your blog all summer and been so inspired by your ideas. Congratulations! Your blog is very deserving. You are so talented and kind to share so many wonderful ideas. Hi! Fabulous idea! 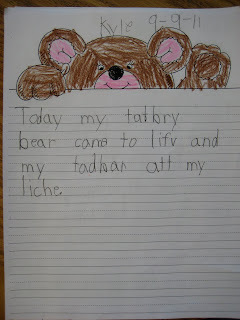 Could you please tell me where you got your adorable teddy bear paper for the writing prompt "Today my teddy bear came to life and..."?